A catalog is a collection of feeds. Catalogs make it easier to find feeds for specific applications. 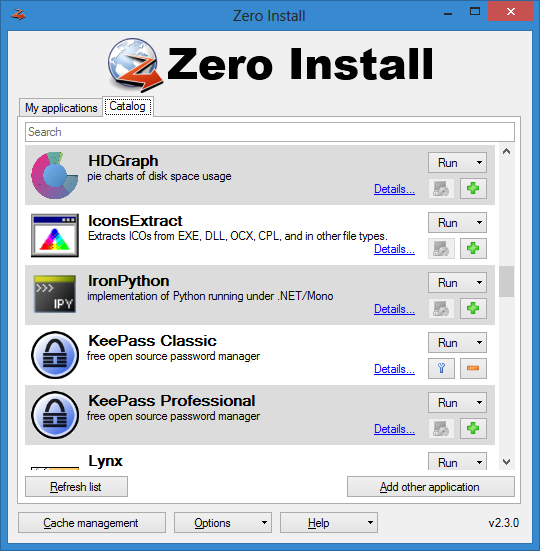 The main window of Zero Install for Windows displays a list of available applications populated by one or more catalogs. The default catalog provided by 0install.de can be extended with or replaced by custom catalogs in the Catalog tab of the Options window. Catalogs allow you to use short names on the command-line instead of entering full feed URIs. Short names are either equal to the application name as listed in the catalog (spaces replaced with dashes) or the application’s executable file name. Catalogs are XML files secured with XML signatures (like feeds). They duplicate most of the metadata contained within the individual feeds but omit information about specific implementations. The catalog then points to the locations the feeds originally came from, not the local XML files on your hard disk.